Home / Health News / Toxoplasmosis â€“ Can Your Cat Make You Sick? Toxoplasmosis is a parasitic infection in warm-blooded animals, including humans, caused by a protozoan organism called Toxoplasma gondii. According to the National Center for Biotechnology Information, T. gondii is the most common protozoan parasite in developed nations. 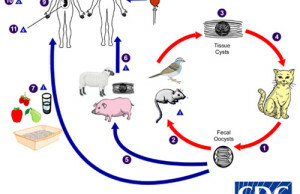 Cats are the definitive host for T. gondii, which means that the parasite can complete its life cycle and reproduce using the cat as the host. The eggs are called oocysts and are passed through cat feces into the environment, where they can infect additional cats and other warm-blooded creatures. If the conditions are right, the oocysts can persist for quite some time in the soil. “Toxo” has appeared in medical news in the last few years, most notably with reports on the effects that T. gondii may possibly have on behavior, as well as a possible link to schizophrenia and bipolar disorders (University of Leeds). Infected mice have been reported to exhibit behavioral changes as well as diminished motor performance, potentially making them more compliant to felines who hunt them. Using personality questionnaires and behavioral tests, studies have uncovered differences in the behavior of infected people versus non-infected people as well. So, the next time someone says youâ€™re acting strangely, blame it on the cat. Despite these studies, toxoplasmosis infection is usually asymptomatic, but in certain cases, this disease can do serious damage. Pregnant women and those who are immune compromised are especially at risk. Pregnant women who become infected may pass the infection on to the developing fetus, resulting in birth defects. Symptoms in these children may include nervous system disorders, premature birth, hearing loss, anemia, and retinal damage. You may have heard that pregnant women should avoid litter boxes (or more accurately, cat feces), and this is why. In otherwise healthy adults, if symptoms do occur, they can be flu-like, and include sore throat, fatigue, fever, and vision problems. In people with compromised immune systems, say to due HIV infection, however, symptoms of toxoplasmosis may be severe and include seizures, lung problems, and severe inflammation of the retina. Others at risk are those who have had organ transplants, are recently recovering from surgery or serious illness, or chemotherapy patients. For the curious, here’s a more complete list of toxoplasmosis symptoms in both humans and cats. 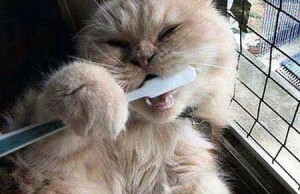 In cats, infection may occur due to consumption of an infected rodent or bird, eating raw meat (or undercooked), or contact with contaminated soil or cat feces. If your cat does not roam outdoors or eat raw meat, she’s much less likely to become infected. Even so, an infected cat is only able to pass on the infected eggs for about two weeks after becoming infected. Because theyâ€™re the definitive hosts, direct contact with cats is often blamed for the spread of the disease. In the developed world, however, the most common method of infection in humans is actually via the consumption of undercooked or raw meat. In fact, according to the Centers for Disease Control (CDC), Toxoplasmosis is the third leading cause of death attributed to food-borne illness in the United States. Approximately 50 percent of the 750 deaths per year due to toxo are food related. Another high risk activity is gardening without gloves, resulting in contamination via the soil. While vegetables are part of eating a healthy diet, they may also be contaminated. In undeveloped countries, soil contamination combined with hygiene and sanitation issues are high risk factors. Below are some tips for you and your cat on how to avoid contracting toxoplasmosis. Observe basic hygiene principles, wash hands frequently, and don’t touch eyes or face with dirty hands. Wash vegetables thoroughly before eating. Do not garden without gloves, and wash thoroughly after gardening. Don’t feed your cat raw or undercooked meat. Follow safe handling procedures with raw meat when cooking. Use scoopable litter and scoop the litter box at least once per day. Wear gloves and a mask when you scoop. Dispose of used cat litter in a sealed container. Never flush any kind of cat litter, even those sold as flushable to prevent environmental contamination, including sea otter impact. Safely and quickly dispose of any prey your cat catches in a sealed garbage container. Don’t let your cat outdoors to roam and hunt. Don’t let children play in public sand boxes which roaming or feral cats may use as a liter box. Editor’s Note: Triclosan is an ingredient found in some antibacterial soaps along with some toothpastes and deodorants.Â New research published in the Journal of Medicinal Chemistry shows that triclosan blocks a key enzyme that the parasize, Toxoplasmosis Gondii, uses to live.Â Though Triclosan can’t be ingested and used as a medication itself, it could lead to the development of new treatments. Kurt Schmitt is a computer support professional, website publisher and founder of Cat Lovers Only. He writes on a wide variety of topics, including self improvement and motivation, weight loss and fitness, cats and pets, and website promotion. ← Previous Story Could You Be Causing Cancer In Your Children? Thanks, Bob, and yes, cats do rule! Thanks for the article. I’ve been having a lot of skin problems, among other issues, since I found my kitten in March 2010. He was a stray born from a feral mother cat who was hanging out in the cemetery near my apartment. 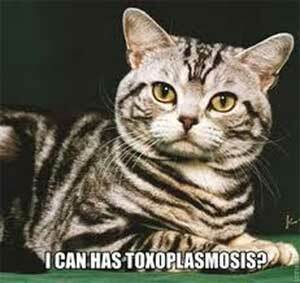 I had 2 doctors question/wondering if I maybe have toxoplasmosis, but they seemed reluctant to look into it further. Is there a simple test to find out if I have it. Also, I read somewhere about a disease people can get from their cats that causes the skin to have white “bumps” that are often mistaken for eczema. Do you happen to know what the cat disease is that causes that? I’m sorry to hear about your troubles. I am not familiar with a disease transmitted by cats to humans that can be mistaken for eczema. There are several tests for toxoplasmosis. The Centers for Disease Control used to recommend that any positive blood tests for toxo be confirmed by a Toxoplasma reference laboratory. I’m not sure if that’s still the case as testing methods improve all the time. I just adopted a kitten about a month ago so I really appreciate this information! Congratulations on being owned by a cat! I’m glad you found the information useful. Kurt, thanks again for this informative article! You’re welcome, and thanks for the opportunity to spread the word. If anyone asks, I’ll be happy to produce a number of authoritative resource links on the subject for further (very dry) reading.